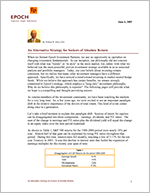 An Alternative Strategy for Seekers of Absolute Return - Epoch Investment Partners, Inc. When we formed Epoch Investment Partners, we saw an opportunity to capitalize on changing investment fundamentals. At our inception, our philosophy did not concern itself with what was “trendy” or “in style” in the stock market, but, rather, with what we believed was the most powerful, proven investment strategy available to us as seasoned analysts and portfolio managers. Today, our core beliefs about investing remain consistent, but we realize that many other investment managers have a different approach. Specifically, we have noticed a trend toward investing in market neutral hedge funds. While we believe this approach has certain benefits, we remain strongly committed to Epoch’s strategy, which employs a “long only” investment philosophy. Why do we believe this philosophy is superior? The following pages will provide what we hope is a compelling and thought provoking answer. As veteran members of the investment community, we have been watching the markets for a very long time. So, a few years ago, we were excited to see an important paradigm shift in the relative importance of the drivers of total return. This kind of event comes along once in a generation. Let’s take a brief moment to explain this paradigm shift. Sources of return for equities can be disaggregated into three components – earnings, dividends, and P/E ratios. The sum of the change in earnings and P/E ratios plus the dividend yield will equal the change in an equity index over the time period examined. As shown in Table 1, S&P 500 returns for the 1980-2000 period were nearly 18% per year. Almost half of that gain can be explained by rising P/E ratios throughout that period. During this time, interest rates fell steadily, touching a low of 3.11% for the ten year Treasury in 2003. It was this decline in interest rates that fueled the expansion of earnings multiples for this twenty year span of time. During this period, which equity one owned mattered less than simply being there – fully invested, everyday. A $10,000 investment in the S&P 500 in 1980 grew to $1.6 million in twenty years. The strategies that worked best were momentum driven, earnings surprise stories. Relative performance dominated absolute return strategies as expanding valuation measures overwhelmed security selection techniques. Many reports were published that showed the costly effects of holding cash or being out of the market on the ten best days in the stock market for this period. To win, the investor had to be fully invested or lose to his peer group or benchmark index. At this time, however, most institutional managers were benchmarked to an index and were not able to short stocks or hold large cash balances. Needless to say, these managers fell quickly out of favor with the new and growing base of investors seeking absolute return goals. Hedge funds filled this vacuum – all 8,000 of them! Today, the most popular version of these funds is called a market neutral fund because it can simultaneously hold long and short positions. So, why does Epoch not endorse the market neutral strategy? Because the market neutral manager is giving up a “free ante” compared to the “long only” manager, and this “free ante” is a big thing to give up. Let us begin to examine this point by looking at a dynamic model of how the real economy relates to the financial economy. To put it simply, these economies are two sides of the same coin. It is the real economy that drives the value reflected in the financial economy (i.e. the equity markets). GDP growth and earnings are inextricably related. Indeed, over a long period of time, it can be shown that nominal growth in earnings essentially mirrors the nominal growth in GNP. Although interest rate fluctuations affect P/E levels, the bottom line is that if the economy grows, so will earnings. In fact, in a world where valuation levels remain constant, stock market levels would rise roughly in proportion to GNP growth over time. This real economic growth is the “free ante” for investors because, over time, the real economy grows and, along with it, so do corporate earnings. And to be market neutral is to pass up the “free ante” provided by economic growth. Conversely, a “long only” strategy captures and profits from real economic growth by using the ante to its advantage. To make this point more clear, imagine two poker games comprised of five people of equal skill at each table. At the first table, both the beginning and ending amounts of chips remain constant. All chips remain in the hands of the players, and are exchanged between players as the game progresses. At the second table, however, a “guest” contributes an “ante” to every hand, but occasionally “taxes” the game by periodically making a claim to a portion of the pot. Over time, however, the guest has made a net contribution to the pot despite the occasional tax. One would expect each player at the first table to conclude the evening with the amount with which he started except for what luck redistributed. In mathematical parlance, this is called a zero sum game. All monies are distributed to the players in a random manner, and the total number of chips in the pot remains constant. The point we wish to emphasize through the poker example is this – smart equity investing is not a zero sum game but, rather, a positive sum game. In a real-life investing situation, the poker game represents the stock market, and the “guest” at table two is the real economy which produces earnings growth over time. The smart investor (i.e. the poker player at table two) knows that there are years when his returns are negative, but over a long period of time he is far ahead of his colleagues at table one, who are engaged in a zero sum game. Remember this basic truism – economic growth leads to earnings gains, which in turn lead to higher stock market levels. Therefore, the “long only” investor is playing by a strategy that, because it profits from the laws of economics, almost guarantees to grow his returns over the long run. But how do we know economic growth will continue? First of all, we live in an age of capitalism. Add the birth of the internet and the introduction of three billion people from developing countries into our capitalistic world society, and it is easy to see how globalization will continue to spur economic growth. It is already evident that The Law of Comparative Advantage1 is driving globalization, and has resulted in faster global growth, better productivity, and greater earnings growth. Therefore, the “ante” should be even higher on a global basis as we work to more efficiently allocate the scarce resources (land, labor and capital) of the global economy. For investors, what all of this means is that a portfolio of well researched global companies with understandable businesses that generate free cash flow applied wisely for the benefit of shareholders should be superior to a market neutral hedge fund. This fact iseven more convincing when one takes into account the “ante” captured by the “long only” approach. The market neutral strategy gives up this ante, and is therefore a less efficient and less profitable way to invest. If an investor still needs more evidence for the ideas outlined above, one should consider that market neutral funds give up more than three percent per year over time. The magnitude of this shortfall becomes abundantly clear when one realizes that three percent doubles in 24 years and four percent doubles in 18 years. Combine this shortfall with high fees, tax inefficiency, and only marginally positive risk adjusted returns, and market neutral hedge funds are placed in an even less constructive light. At Epoch, we prefer to ignore the market neutral trend and focus on a “long only” strategy that captures the full power of sustained economic growth. Why give up the “ante” when it is there for the taking? 1This Law states that every nation should specialize in making what it does well and then trade those goods for other goods and services it desires. If every nation follows this maxim, all countries are better off then if they tried to only meet their needs through 100 percent internal production.